An additional 125 million adults joined the ranks of those vulnerable to climate change between 2000 and 2016. During the same period, weather-related disasters also increased by a startling 46 per cent. These claims were made by the Lancet Countdown on health and climate change—a comprehensive report on health and climate change—released on Monday (October 30). The report was jointly prepared by 24 academic institutions and intergovernmental organisations based on 40 indicators which factor in relevance to public health, both in terms of the impacts of climate change on health and the health effects of the response to climate change, relevance to main anthropogenic drivers of climate change; geographical coverage and relevance to a broad range of countries and income groups; data availability; and resource and timing constraints. The report notes that climate change disproportionately affects citizens in low-income countries which bear 99 per cent of damage-related costs. In 2016, climate change is estimated to have cost a whopping $129 billion around the world. This number has been on the rise since 1990. The most alarming impact on health from changing climate is perhaps the increase in exposure to heat waves. The indicator on heat wave exposure revealed that between 2000 and 2016, human exposure to warming was about 0.9 degrees Celsius which is more than double the average temperature increase in the earth. The increase in exposure has been driven partly by high population densities in India, parts of China and sub-Saharan Africa. According to the report, 125 million people have been added to those vulnerable to heat waves between 2000 and 2016. The spike was particularly visible in 2015 when the additional number of vulnerable adults reached 175 million. The report also notes an increase in weather-related disasters with 306 disasters recorded on an average between 2007 and 2016, a 46 per cent increase compared to the 1990-99 average. More than 90 per cent of all disasters have been associated with weather-related events in the last 20 years with Asia being the continent most affected. The report states that 2,843 events were recorded between 1990 and 2016, affecting 4·8 billion people and killing 505,013 people, most of which have happened in poor countries. Interestingly, the report also shows that there has actually been a decrease in the number of people affected by floods worldwide despite an increase in frequency. However, authors predict that this decrease is only temporary. 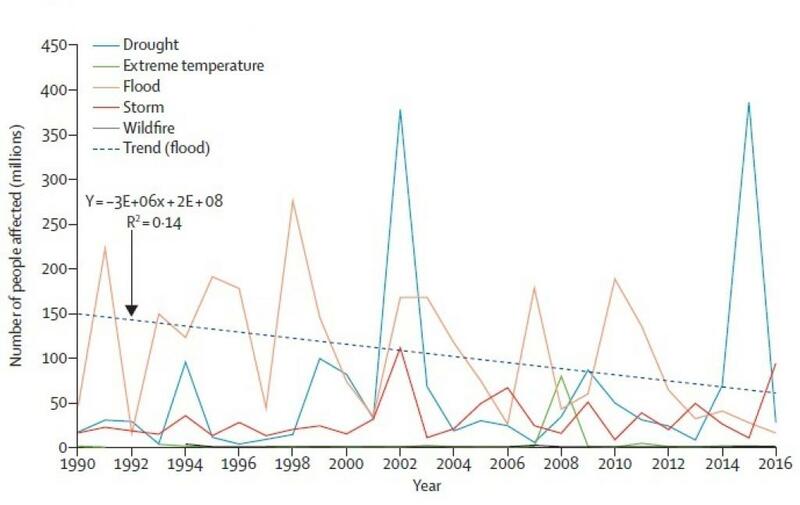 The 2015 Lancet report on health impacts of climate change estimated that an additional 1·4 billion drought exposure events and 2·3 billion flood exposure events will occur by the end of the century. Climate change has a role to play in the spread of infectious diseases, claims the report. While the overall trend is a decreasing one, infectious diseases are responsible for about 20 per cent of the global disease burden and account for more 80 per cent of international health hazards, according to the World Health Organization (WHO). Increase in temperatures, notes the report, has likely had an aggravating impact on the transmission potential of vector-borne diseases like dengue. The capacity to transmit diseases in two vectors of dengue—Aedes aegypti and Aedes albopictus—has increased by 3 per cent and 5·9 per cent respectively, compared with 1990 levels, and by 9·4 per cent and 11.1 per cent, respectively, compared with 1950 levels. Increasing undernourishment, especially in the most vulnerable countries, has also been linked to climate change. The report explores the link between increasing undernourishment and reducing yields as temperatures increase. According to the report, increasing temperatures reduce global wheat production by 6 per cent for each 1°C increase, while rice is sensitive to increases in night temperatures, with yields reducing by up to 10 per cent for each 1°C increase during growing season. 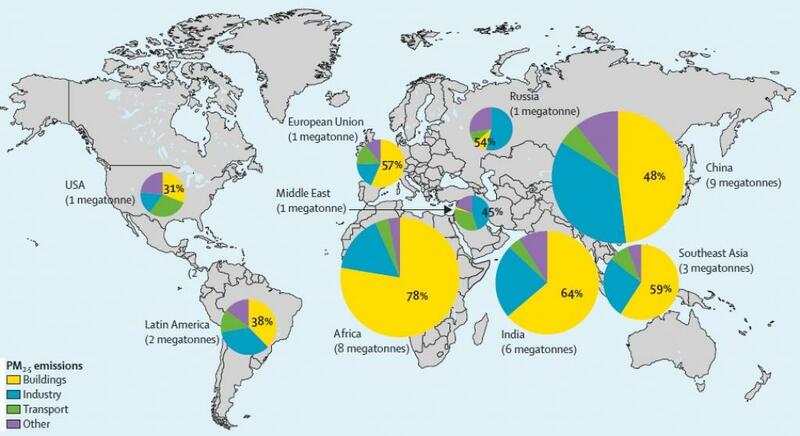 The negative impact of high temperatures on crop yields in countries has been detailed in several studies. A similar reduction in marine productivity has also been noted to contribute to an increased risk of nutrition deficiency and certain diseases for up to 1.4 billion people. While health risks have considerably increased with climate change, productivity of labour has dipped. 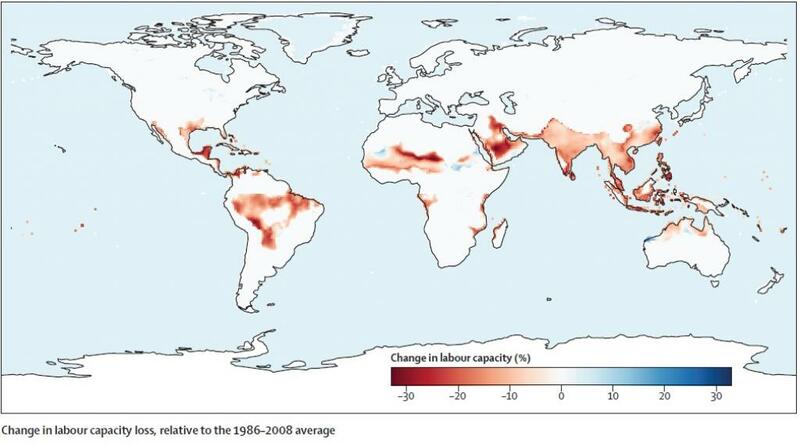 Estimating labour capacity with wet bulb globe temperatures, the report concludes that labour capacity has decreased by 5·3 per cent between 2000 and 2016, with a dramatic decrease of more than 2 per cent between 2015 and 2016 compared to levels between 1986 and 2008. The report has linked climate change with the deteriorating air quality in cities across the world. About 2,109 cities, or 71 per cent of the 2,971 cities being monitored by the WHO, do not satisfy WHO annual fine particulate matter exposure recommendations. Estimates in the report suggest that exposure of populations to PM2.5 has increased by 11.2 per cent since 1990. Based on data from 246 randomly selected cities from the database, the study found the highest concentrations of PM2.5 in central, south and East Asia. The report has noted that while pollution in high-income settings has reduced in recent decades, globally, it has marginally increased. The WHO has attributed about 3 million additional deaths worldwide to ambient air pollution. Noting that world is poised for a 2.6-4.8°C increase in temperatures by the end of the century under the current response, the report makes a strong case for shoring up adaptation and mitigation responses through carbon pricing and low-carbon growth.